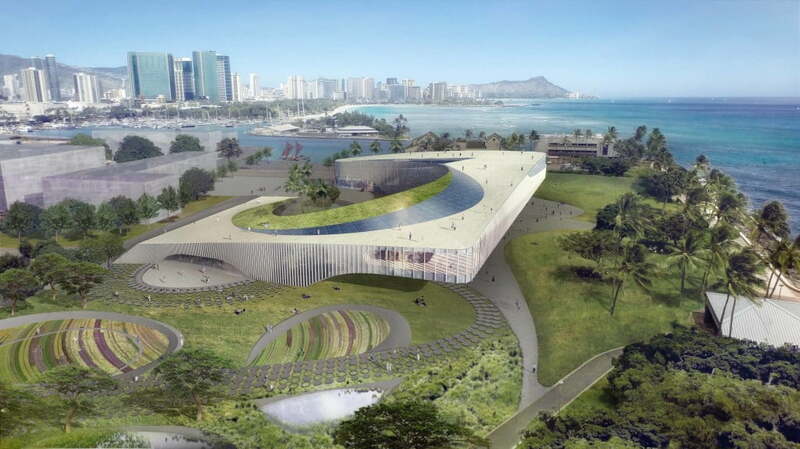 Barack Obama Presidential Center in Honolulu, Hawaii including architects Snøhetta and Allied Works, have developed designs for Hawaii’s bid to host Barack Obama presidential center library. According to the Kumulipo, a native Hawaiian creation chant, life begins with ‘āko‘ako‘a, a single coral polyp which over time creates the land and all life that inhabits it. As a diverse collective of individuals growing over many generations, the notion of coral parallels the ambitions of the Presidential Center to become catalyst of thought, action, and community. 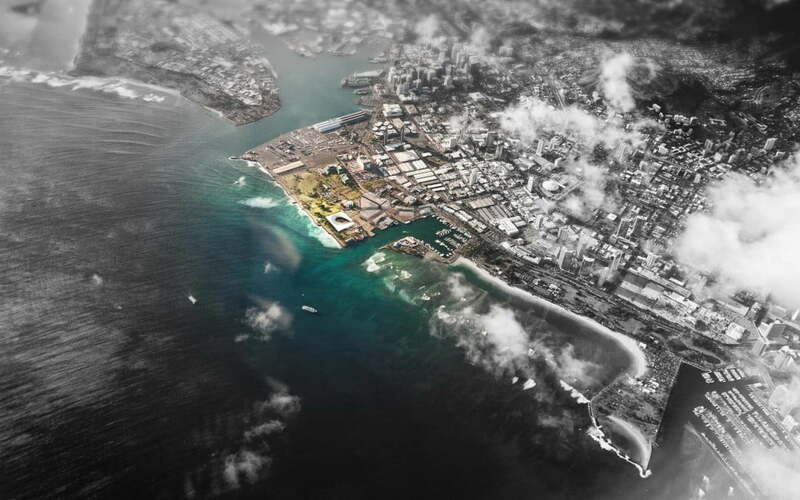 The genealogy of the proposed site itself, reclaimed land sitting above what was once the exposed reef shoreline, provides a historic precedent which reinforces this connection. Much like the polyp, the Center has the unique opportunity to create a new environment that encourages assembly, provides places to congregate, and creates shared community resources. 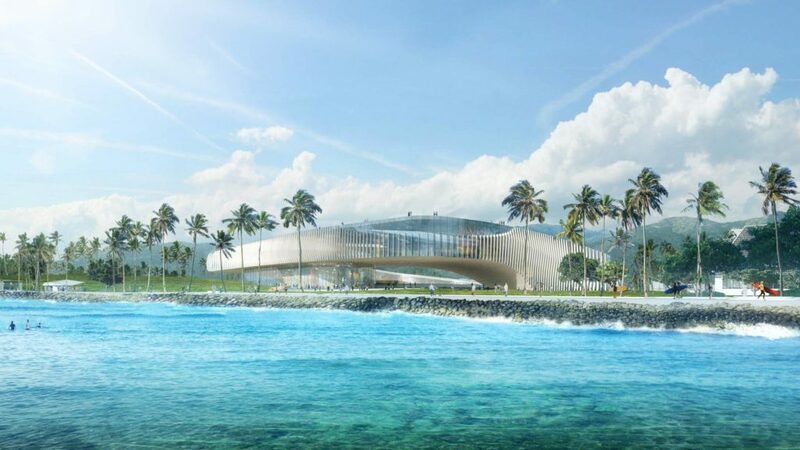 The University of Hawaii commissioned three designs for its presentation in the battle to build the US President’s official library this month, having identified a beach site adjacent to the Kaka’ako Waterfront Park. Although the University of Chicago and Columbia University in New York are the current favorites to win the bid, Hawaii is hoping to tempt Obama by turning the library into a multipurpose presidential center design for education, including a Global Youth Leadership Academy and a museum. All three locations have a personal connection with Obama, who grew up in Honolulu, studied at Columbia and worked in Chicago. Chicago mayor Rahm Emanuel was Obama’s first chief of staff at the White House. Scandinavian firm Snøhetta teamed up with Honolulu studio WCIT Architecture to propose a building that appears square from the outside, but opens at one corner into a rounded courtyard with a pool. One end of the structure meets the ground, providing public access to a roof planted with grasses. The presidential center design team said the building was based on the idea of a coral polyp growing to create a “new environment”. “The genealogy of the proposed site itself, reclaimed land sitting above what was once exposed reef shoreline, provides a historic precedent which reinforces this connection,” they said. New York and Portland firm Allied Works proposed a series of pavilion-like glazed structures, connected by a twisting roof with elongated teardrop-shaped openings. The final team, consisting of New York studio MOS and local firm Workshop-Hi also envisions a series of smaller spaces, connected with a green roof. 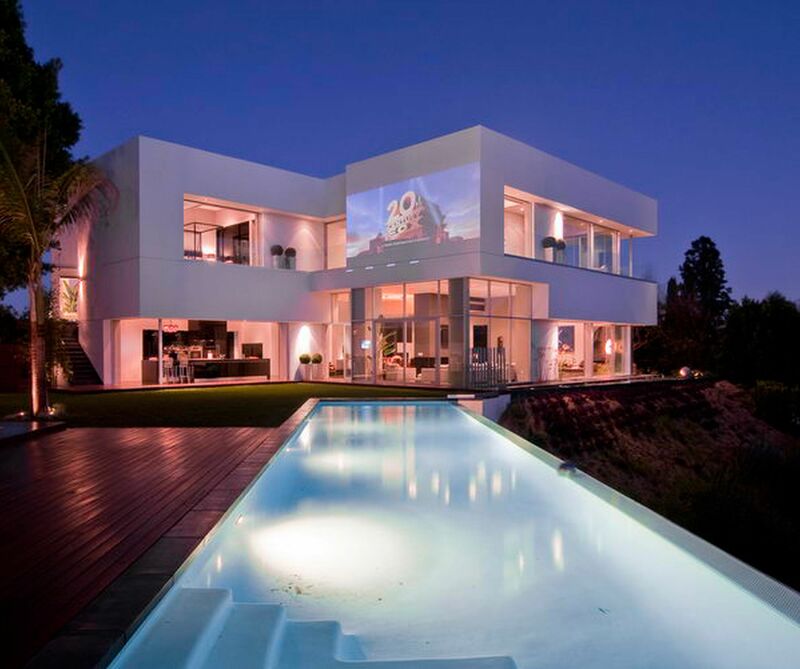 The roof structure rises up from the ground and is then staggered over multiple rectangular levels, with large circular openings punched through each one to let light shine through. 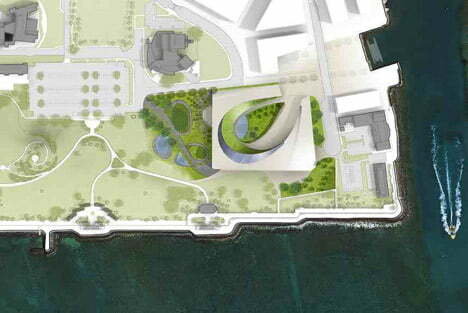 “The proposed presidential center design celebrates the diversity of Hawaii’s natural environment by expanding the adjacent Kaka’ako Waterfront Park into a campus of interconnected pavilion structures, public accessible courtyards, a ramped landscape podium, and a large park-like roof structure composed of community and public gardens,” said the team. The university also commissioned Honolulu company Ferraro Choi and Associates to develop a “living building” system for the project, exploring “resource conservation and bio-mimicry-inspired building solutions”. Once a site and host university has been confirmed, the library will be built to commemorate the president’s term in office with an architect selected personally by Obama. 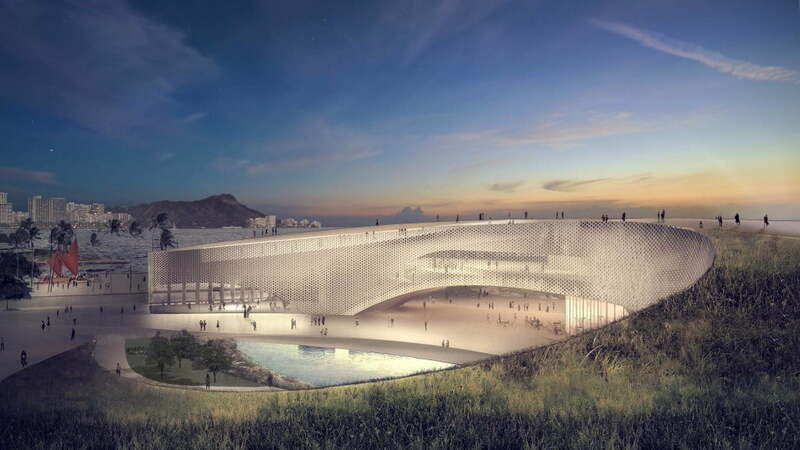 Rumors have already linked British architect David Adjaye to the project, and the president has previously referred to Adjaye as his favorite architect. Adjaye has already designed a number of library buildings in North America, including The Francis Gregory Library and The William O. Lockridge/Bellevue Library in Washington D.C.
Hawaii said it commissioned its own architectural proposals to demonstrate the possibilities of the waterfront site. The University of Hawaii’s bid is being backed by the state and municipal governments as well as a number of non-profit organizations and business sponsors. Obama will select the winning site in March 2015, and the project is expected to cost $500 million with the president expected to begin fundraising in earnest next year. It will be managed by the The Barack Obama Foundation, which was founded in January 2014 for the purpose.